SICK presents its all-new AHS36/AHM36 singleturn and multiturn absolute encoders with IO-Link interfaces. The IO-Link interface allows the encoders to be seamlessly integrated into a variety of high-level networks. They can also be configured using the IO-Link master or SOPAS Engineering Tool. This variant makes even more options available for obtaining measurement data and monitoring motion. Features, such as intelligent diagnostic functions, allow the AHS/AHM36 family of absolute encoders to evaluate maintenance intervals for the entire system, increasing system reliability and setting new standards in flexibility and diagnostics. With their rotatable male connector or cable outlets, variety of mounting hole patterns, and adapter flanges, these encoders can be used in almost any application. The singleturn/multiturn resolution, counting direction, and other parameters can be individually adjusted when the encoders are integrated with different networks. The encoder also communicates diagnostic data such as temperature or operating time. The encoder family’s generous operating temperature range of –40 °C to +85 °C and protection class of up to IP67 means the encoders can even be used in the harshest ambient conditions. The singleturn variant of this rugged, reliable, fully magnetic sensor system offers a maximum resolution of 14 bits and 26 bits for the multiturn variant. 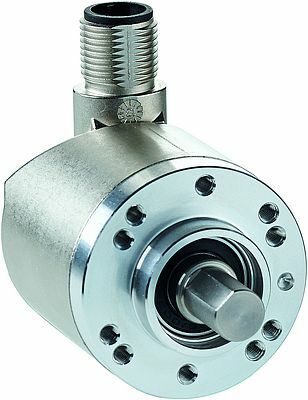 All AHS/AHM36 absolute encoders are also available with IP69k stainless steel housing.